The ongoing crisis in Yemen, whose end is not in sight, is giving Iran an opportunity to turn Yemen into a testing ground for various weapons it is developing for the maritime and military arenas. The Houthi rebels, who have taken over parts of northern Yemen including the capital, Sana’a, are getting ongoing assistance from the Iranian Revolutionary Guard Corps (IRGC), mainly via Hizbullah trainers, in the use of missiles and rockets along with an ongoing supply of other weapons such as drones, explosive devices, and battlefield materiel. On February 10, 2017, Abd al-Malik al-Houthi, leader of the Houthis in Yemen, said that they were beginning to manufacture drones and other airborne weapons, including surface-to-air missiles that can intercept the Saudi-led coalition planes as well as missiles “that can hit Saudi territory and beyond.” Since the beginning of the year, the Houthis have increased their missile fire, including Scuds, from Yemeni territory at different targets in Saudi Arabia, including airports and civilian infrastructures, along with missile fire at coalition targets in Yemeni territory. Hizbullah advisers are taking part in some of the missile launches. Since the beginning of 2016, the Houthis have been using drones for intelligence-gathering missions, and also, according to some reports, to attack the Saudi-led coalition forces in Yemen. 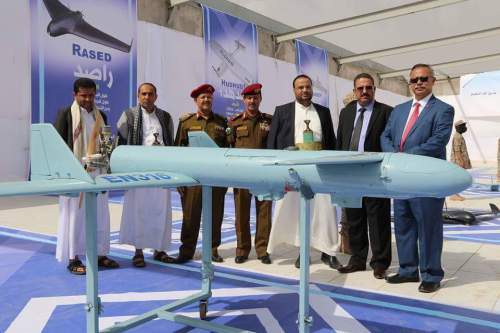 Sheikh Abdulmalik Mikhlafi, deputy prime minister of the recognized Yemeni government, said that a Houthi drone intercepted by the Yemeni army had a missile-firing capability, a fact that points to Iran’s growing involvement in the crisis in Yemen. Notably, the Qasef attack drone is very similar to previous drone models manufactured by Iran in the Ababil series. The other models, too, have similar features to drones deployed by Iran. Along with the use of drones in the aerial domain, the Houthis have been increasingly active in the maritime domain in the Bab el-Mandab area. In addition to the occasional launch of Iranian-supplied anti-ship cruise missiles, the Houthis have begun to deploy, apparently with Iranian assistance, unmanned remote-controlled maritime craft. Sources in the U.S. Navy believe the January 30, 2017, attack on the Saudi frigate Al-Madinah near the Yemeni port of Hudeida was carried out by an unmanned and guided boat. Vice Adm. Kevin Donegan, U.S. Fifth Fleet commander, said, “Our assessment is that it was an unmanned, remote-controlled boat of some kind.” According to a report by the U.S. Naval Institute, the naval craft was provided by the navy of the Iranian Revolutionary Guard Corps (the IRGCN). At first, Saudi Arabia claimed the attack had been carried out by boats bearing suicide bombers, and the Houthis claimed they had fired a shore-to-sea missile (at the moment of the strike there were shouts in the background of a video of “Allahu Akbar [Allah is the Greatest]! Death to America! Death to Israel! Curse upon the Jews! Victory to Islam!”). It later turned out that it was an unmanned naval drone ship. Such vessels pose a new threat to civilian maritime traffic, open a new page in the clashes between Iran and Saudi Arabia in this sensitive arena, and could reach other Iranian-supported terror organizations in the world. During President Obama’s tenure, small IRGC craft often flaunted their power very close to the U.S. naval forces in the Persian Gulf, threatening them; U.S. reactions were minimal for fear of a clash. Iran would also send drones over U.S. vessels and photograph their activity. The aim was both to prepare for a possible confrontation with these ships and to disrupt their ongoing activity in the area. In the naval maneuvers Iran conducts from time to time, like the recent one in which it revealed a new shore-to-sea missile, it practices the sinking of large U.S. vessels including aircraft carriers. The continuing conflict in Yemen, which is being waged both at sea and on land, gives Iran an opportunity to test some of its capabilities and military doctrines “for real.” Such activity poses a risk to the extensive maritime traffic in the area of Bab el-Mandab, which connects the Gulf of Aden to the Suez Canal. Developing a capability like an unmanned warship is a complex endeavor, and it appears that the Houthi rebels have not done so by themselves but with Iranian assistance or have received the boats ready for use. Another possibility is that the boats were deployed by the IRGCN or by Hizbullah trainers who also are assisting the Houthis’ missile units.